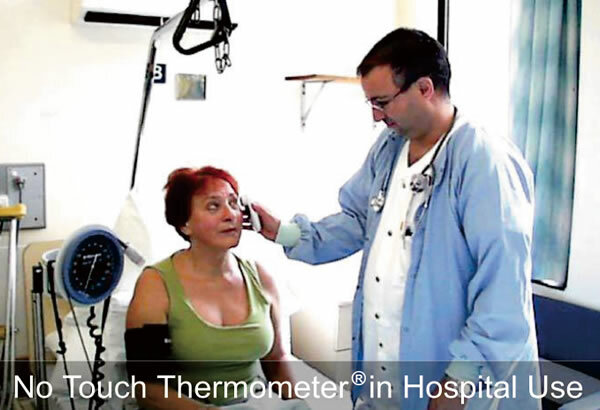 The No Touch Thermometer® measures body temperature NON-INVASIVELY, with no direct contact, making it SAFE & HYGIENIC. Using advanced infrared technology, the No Touch thermometer® measures the infrared heat and converts this measurement into an oral equivalent temperature. The No Touch Thermometer is ACCURATE and meets the accuracy requirements of ASTM E-1965-98 standard. Using advanced technology the No Touch thermometer® measures the temperature of the infra red heat given off by the arterial blood supply under the temple skin and converts this temperature into an oral equivalent temperature. Ideal for the uncooperative patients and children, no need to stand still,wake up or touch. Currently servicing hospitals, aged care facilities and many GP’s. No need to stand still, wake up or touch. No Trauma, No pain, No Tears, No Touch.